More than just a skincare product, the Biologi brand is built on a foundation of educating consumers first and providing a product that solves their problems second. We steadfastly believed that when armed with all the information about what’s in skincare products, consumers can make informed choices about the products they put on their skin, and therefore expose their system too. That’s right, not all the products we use are as kind to skin as the marketing taglines would have us believe, and it’s the responsibility of each consumer to find out what’s in their products BEFORE they use them. Biologi is a revolutionary range of serums that are breaking the mould in skincare. We’re encouraging consumers to question their habits and re-think everything they thought they knew about their skin, and that generates A LOT of questions for our experts. Here are some of the most common questions we receive, answered by our skincare experts. How do I cure acne? By the time people who live with acne contact us, they’ve generally tried every acne treatment under the sun. Their skin is dry and sore from the harsh procedures prescribed by GPs, and they’re at a loss with how to treat pimples and inflamed, often-painful blemishes. The bad news is there’s no quick fix for acne. While prescribed medications may reduce the visible symptoms, acne is always caused by an internal imbalance that must be addressed before you can ‘cure’ acne. Imbalances may be hormonal, or they may be diet-related (such as allergy or intolerance to dairy or gluten). Gut health and lifestyle are critical when treating acne and you must work with the relevant healthcare professionals to diagnose and treat the CAUSE of acne rather than the symptoms. The good news! Bd serum. Bd serum won’t cure acne, but it can help reduce redness and inflammation, unblock pores from oil and debris making pimples less likely, and lightly exfoliate to keep dead skin cells moving. When used in conjunction with a commitment to repair the root cause of acne, Bd serum is our go-to for all those who live with the painful condition. Should I have a chemical peel? N to the O – heck NO! Firstly, the idea of putting harsh chemicals on delicate skin cells so they blister and peel off makes no logical sense and goes against everything we’re trying to achieve in skincare. The skin is the body’s largest organ, and our goal is to nourish and protect cells to create a strong barrier that protects the rest of the body. When you burn and peel off your skin, while complexion may appear luminous and bright for a few days, you end up causing more damage. Each skin cell has a life cycle and while growing through to the outer layers the cells strengthen so they can better protect against the harsh elements such as sunlight and environmental toxins. If cells are exposed before they’re ready, exposure to the environment may cause sensitivity, inflammation and dehydration. Instead of a chemical peel (please, just no! ), concentrate on using products that have a high activity which means they change cells naturally on a cellular level rather than artificially as moisturisers and other products can do. All Biologi serums are 100% active and they get to work strengthening, hydrating and nourishing cells long before they reach the skin’s surface giving the luminous glow you strive to appear with chemical peels. Use with a mild exfoliant two to three times a week and the results will be the same, except you won’t have caused potentially irreparable damage to the skin barrier in the process. What products cure sensitised skin? If you live with skin that is painful, itchy, red or stinging when exposed to new products or extreme elements such as wind or heat, the chances are you’re living with sensitised skin. Sensitised skin is something that many people ‘put up with’ but could be causing problems on a deeper level. All signs of sensitised skin point to the outer layer of skin, the skin’s protective barrier, being damaged or broken. Poor quality barrier leads to toxins getting into the surface causing the symptoms, and natural hydration getting out causing dryness. The key to curing sensitised skin isn’t in the products you use (which often contain harsh chemicals that sit in the skin highlighting symptoms) but in repairing the dermal layer. You can read more about repairing sensitised skin here. What’s the ideal skincare routine? The best skincare routine depends entirely on your skin type, skin concerns and goals and can’t be prescribed in a blog post. Cleanse: Skin picks up debris and dust while you sleep, and pores can become blocked with sweat. Start every day with a thorough cleanse using a product of your choice. 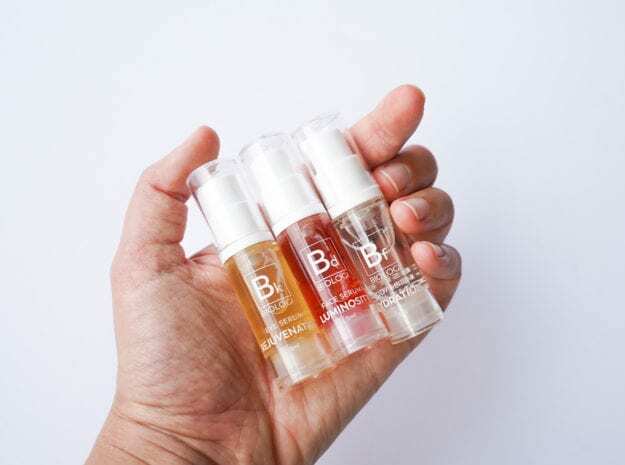 Biologi serum: Once the pores are open and clean, wait a few moments then apply a Biologi serum of your choice to nourish, hydrate and provide a base for makeup. Sunscreen: Don’t leave the house without sunscreen. While some brands are better than others for your skin, not wearing it at all is the worst thing you can do for delicate cells. Makeup: If applicable, put on your makeup and leave the house knowing your cells are cleansed, hydrated and protected for the day ahead. Remove makeup/cleanse number one: Use a face halo to remove the first layer of makeup. We love face halos as they’re chemical free and get to work to remove the grime from the day, even removing eye makeup. Cleanse number two: Always double cleanse to remove the deeper layers of dirt and residue from sunscreen and debris. This extra step will help serums penetrate deeper and work harder while you sleep. Biologi serum: Use your serum of choice to get to work while you sleep to wake up with skin that’s as fresh as you feel after a good night’s sleep. Use a mild exfoliant of choice two to three times a week in the evening to keep dead skin cells moving and your complexion bright. When you add Biologi to your routine, you reduce the number of products you need simplifying your routine to just a few steps and products. What do you want to know about skincare? Ask our experts in the comments below, or head over to @biologiserum on Instagram and send a DM. We respond to every skincare enquiry to help consumers make better choices about the products they use on their skin.